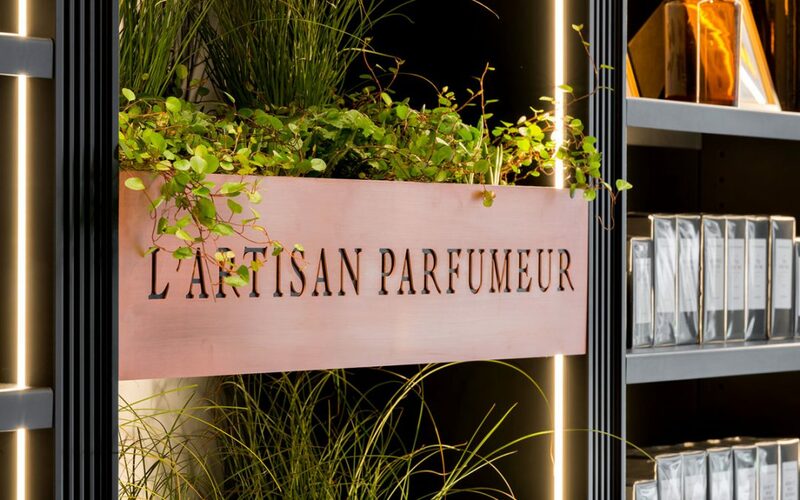 When settling in, last May, at 167 boulevard Saint-Germain, L’Artisan Parfumeur, the famous fragrance designer, generated a revival of the brand. Indeed, a few months earlier, all its Parisian shops closed for a thorough facelift. Today, a new chapter begins. Brand new, the elegant and sleek shop of Saint-Germain-des-Prés is distinguished by its miniature herb-garden wall. In this surprising and romantic space where flowers and plants grow, “the natural spirit” of the brand comes to life. All since its creation by Jean Laporte, botanist and chemist, the credo of the House is such: natural and rare ingredients. But to celebrate its 40 years properly, L’Artisan Parfumeur did not settle with redecorating its stores and modernizing the packaging and bottles, now dressed in smoky black, the House also offers 6 new fragrances added to the collection “Natura Fabularis”. Therefore, alongside the 40 existing perfumes, the bucolic “Violaceum”, “Venenum”, “Tenebrae”, “Arcana Rosa”, “Mirabilis” and “Glacialis Terra”, all signed by designer Daphné Bugey, come to intensify the nature of an imaginary garden. Olfactory dreams that undoubtedly find their place alongside best-sellers of the House such as “Mûres et Musc” and “Premier Figuier”.